A few weeks ago someone vandalized several of the SSRTA signs near the viaduct bridge. They pulled them out of the ground and threw them off the middle of the bridge. Jack Miller of Yarnell kept making the statement "Why would anyone want to vandalize a sign when they cost so much" Don't people realize that the SSRTA is here to provide a place for atvers to ride. He kept saying I'm going to get that sign in the middle of the Red Moshannon. Well, today, October 22, 2012, Jack met with a few of his friends, Charles & Carole Jensen and took off for the viaduct. "A man on a mission." Please see the pictures of Jack retrieving the signs. Thank you, Jack Miller, for your determination. Our raffle is one of our largest fundraisers of the year and we want to thank all the sponsors that provided the raffles items for 2012. We also want to thank all of you that supported the raffle by buying tickets. The trail exists because of your support. Bestline Powersports and the SSRTA provided a great meal of Pulled pork, cole slaw, red skin butter parley potatoes & beverages, Jim Verost Chili- Whow --Bestline Powersport Cupcakes & a special atv cake made by Elizabeth Scalzo & her mom Donna Bell. Of course the special peanut butter cookies and brownies made by Eileen Long & Peg Brooks were great! Polaris 500 Sportsman - Bestline - Jeremy Taylor, Frenchville, Pa.
$150.00 - Eric & Peg Brooks - David Lichvar, Manns Choice, Pa.
$100.00 - Raymond Tires - Kiersten Gibson, Howard, Pa.
$100.00 - Restek - Scott Confer, York, Pa.
$190.00 Full Vehicle Detail - Joel Confer Toyota - Jessica Rice, Mt. Joy, Pa.
$50.00 gift cert. - 234 Motorsports - William Lingle, State College, Pa.
$50.00 Cash - Eileen & Terry Long - William P. Watson, Bellefonte, Pa.
$50.00 gift cert. - Bestline - Jerry Beveridge, Philipsburg, Pa.
Large Riding Helmet - Carole & Charles Jensen - D.C.Shultz Sr, Flemington, Pa.
Two night stay - Marienville Forest Lodge - Gary Rees, Snow Shoe, Pa.
$50.00 gift cert. - Steve Seltzer Honda - Gary Elder, New Castle, Pa.
$25.00 gift cert to Sheetz - Williamson Insurance - Aaron Ransdorf, Renovo, Pa.
$50.00 gift cert. - Saddles ETC. 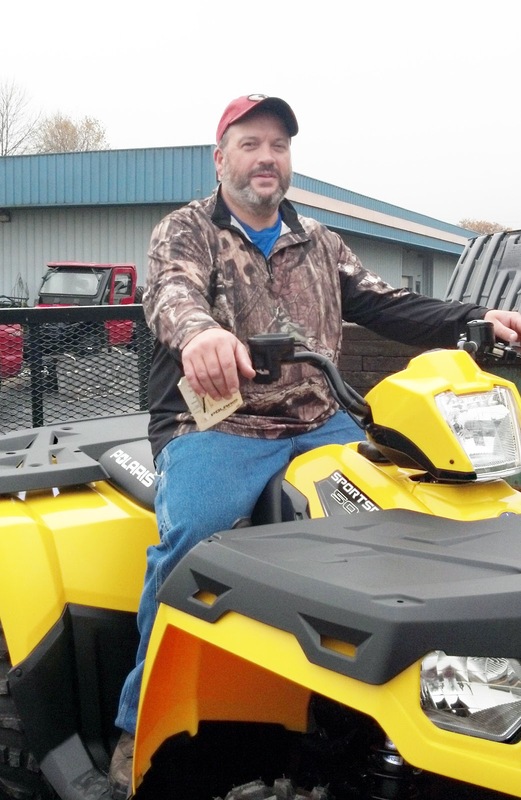 of Centre Hall - Frank Wetzler, Bellefonte, Pa.
Atv winch - Truck Stuff & More - Diane Hoyt, Grampian, Pa.
$25.00 gift cert. - Valley Ag & Turf of Centre Hall - Dave Aissell, Tyrone, Pa.
$25.00 gift cert. to Sheetz - Williamson Insurance - Joe Confer, Beech Creek, Pa.
$50.00 Cash - Barbara & Mike Poore - Laura Snider, Spring Mills, Pa.
$25.00 gift cert. to Sheetz - Williamson Insurance - Erin Cramer, Snow Shoe, Pa.
$100.00 Cash - Restek - Glenn Mummert, Hanover, Pa.
$25.00 gift cert. - Track N Trail - Robert Livergood, Moshannon, Pa.
$25.00 gift cert. - West Branch Dairy Diner - Carole Jensen, Warriors Mark, Pa.
$25.00 gift cert. to Sheetz - Williamson Insurance - Tony Wivell, Spring Grove, Pa.
$25.00 gift cert. - H & B Hardware of Kylertown - Donald Johnson, Orangevlle, Pa.
$100.00 Cash - Restek - Donna Hall, Falls Creek, Pa.
$25.00 gift cert. - Track N Trail - Kathy Wright -- Frenchville, Pa.
$30.00 gift cert. - Snow Shoe Sandwich Shop - Jeff Hosband, Lewistown, Pa.
$50.00 gift cert. - Bestline - Robert G. Hile Sr., Watsontown, Pa.
$25.00 gift cert. - Genna Beer Distributor - Tiffany Moskol, Drifting, Pa.
$100.00 - Restek - Ed Gower, Mount Joy, Pa.
$25.00 gift cert. for Sheetz - Williamson Insurance - Robert Michaels, Lanse, Pa.
$25.00 gift cert. - Valley Ag & Turf of Centre Hall - Pattie Jo Horner, Clarence, Pa.
$25.00 gift cert. - Trach N Trail - Scott Patterson, Waynesboro, Pa.
$25.00 gift cert. - Jack's Snack Shack - Lance R. Reese, Port Matilda, Pa.
$100.00 - Terry Louer Insurance - Charles Jensen, Warriors Mark, Pa.
$25.00 gift cert. - West Branch Dairy Diner - Krista Tobias, Snow Shoe, Pa.
$50.00 - Resteck - Brian Cardaso Sr. - Etters, Pa.
Tool & flashlight kit - Mt. Top True Value Hardware - Irene Biggans, Bellefonte, Pa.
$25.00 gift cert. for Sheetz - Williamson Insurance - Dan Masullo, Bellefonte, Pa.
$50.00 gift cert. - Bestline - Bill Dudish, Snow Shoe, Pa.
$50.00 - Restek - Mary L. Horn, Snow Shoe, Pa.
$50.00 - Jim Verost Used Cars - Mike Zyry, Middleburg, Pa.
$25.00 gift cert. - Genna Beer Distributor - Donna Bowmaster, Howard, Pa.
$100.00 - Marcon Roofing - Ken Howell, Bellefonte, Pa. Winner of the Quilt made by Mary Jane Peters -- Edward W. Eckels, Altoona, Pa.
Jeremy Taylor of Frenchville, Pa. 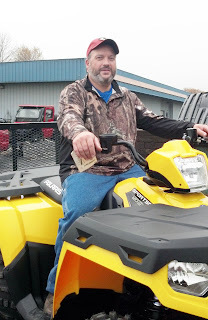 Winner of the atv. The Snow Shoe Rails to Trails in conjunction with Bestline Powersports held Youth Certification Training at Bestline Powersports in Centre Hall on October 13, 2012. George Holt, Eileen & Terry Long, Ty Hostettler, Dave Walker provided the training along with Rockrock Forest Ranger "Ed Kitchen". The group of youths were eager to become certified so they could also ride state trails with their parents. A meal was provided by Bestline & SSRTA to all that attended. Trilby Mayes presented a SSRTA t-shirt to all the trainees. The event is always held on the first weekend in October. Normally there are 75 to 90 miles of trails to ride. A lot of that was reduced this year as two sections of the trail were closed. The road from the Forest Lodge to the back of Marienville was one of those roads closed. It made the ride a little more difficult as we had to trailer our atv's to Marienvile and unload instead of riding from the motel. A lot of people attending were from Ohio, New York and Pa. Frank & Sue at the Forest Lodge made it a comfortable stay under the conditions of trails being closed. This event helps sponsor the community - fire departments, Lions Club, Relay for Life, local ATV club and many others. For those not wanting to atv can tour some craft shows in surrounding towns -- Franklin, Sheffield. A couple great restaurants for breakfast & dinner. Hopefully the roads will be open for next years event. View photos from this event by clicking here.